Mamshit - Photo provided by Michael Novins. The Incense Route and Desert Cities of the Negev reflects the hugely profitable trade in frankincense and myrrh. 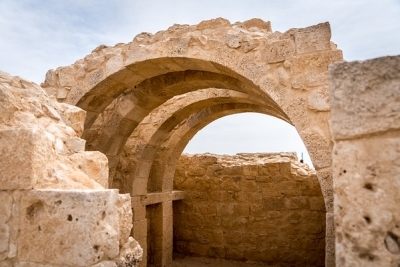 The ruins which compromise the Incense Route of the Negev mostly date back to the crusader era, even though the cities themselves are much older. That is why you will see Christian iconography and other symbols. The towns were part of a network of trading sites which extended from Oman, through Saudi Arabia, Jordan, and Israel. 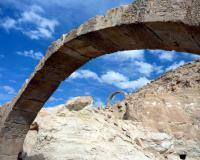 The Nabatean city of Petra was also part of the same trading network. I visited Avdat and Shivta National Parks, which are pretty easy to reach by car. You could visit all of the sites by car on a day trip from Jerusalem or Tel-Aviv. During my visit in Israel I have visited only one of the inscribed locations - Mamshit. The site is located not far from the main road along the Jordanian border from Eilat to northern parts of Israel. Visiting Mamshit may be easily combined with Masada or Dead Sea, as these places are relatively not far from this site. Mamshit played an important role during the golden times of Incense Route but it was abandoned after Arabian conquest of Palestine. Despite this long time of abandonment (or maybe because of that) Mamshit is relatively well preserved and may please even those visitors who are not big fans of archeology. Mamshit is not big and even one hour stay may be enough to visit the site and allows visitors to realize how the city looked like 1500 years ago. In December the site was not crowded at all (in fact it applies to all WHS in Israel except Jerusalem) and spending 22 NIS for the ticket was definitely worth it. I often find that a good guide as to how “worthwhile” a WHS visit has been is the extent to which, 2-3 weeks later, I feel I can find anything of value/interest to say about it in a review and how much “follow up” interest and research it has generated. On that basis our Incense Route visits failed miserably! We visited Mamshit, Shivta and Avdat in that sequence across 2 days by car using the Beersheba area as a base. It can’t be that we rushed the visits as we in fact had plenty of time and only additionally visited Tel Beersheba and the Makhtesh Country on those days. We have previously visited the rock-cut Nabatean sites of Petra and al-Hijr (Saudi Arabia) so, whilst we were perfectly aware that the Incense Route sites were not of that type, we did perhaps have expectations which were too high. What you get is a lot of not particularly spectacular desert scenery (though the more impressive makhtish are close by) and a lot of “walls” - Walls of houses, temples, churches, mosques, bath-houses, wine presses, markets etc, covering periods from around 1st century BCE through to around 5th century CE and encompassing Roman and Byzantine architectural styles. Some of the walls are accompanied by arches (Photo from Avdat), pillars and other architectural features plus some carvings and the occasional reservoir/water collection system (but NO tunnels, unlike so many of the sites we visited on this trip!! ), mosaic (none of which were particularly striking compared with others we saw during this “holiday of mosaics”) and tomb (The most significant of these was a burial cave from the Roman period at Avdat – but this was nothing compared with those at al-Hijr and Petra). The situations of the 3 sites do vary somewhat. Mamshit is located on a bluff above the Mamshit river gorge. Avdat is situated high on a hill and Shivta is remotely located in reasonably flat desert country towards the Egyptian frontier. Avdat was the busiest and had the most significant “Visitor centre” with an Audio-visual presentation. It was also well provided for with Souvenir shops and even a McDonalds! It seemed to be on the “coach party” circuit. Shivta was the most remote – it did have a guardian to hand out the brochure (though he didn’t “awake” until we were leaving) but didn’t have an entry fee. It was however most “crowded” of the sites during our visit as there was a large group of Israelis visiting it by coach as part of their training to become licensed guides! We were perhaps surprised by how late these cities flourished – Shivta in the 4th/5th century when it was primarily a Christian town. Mamshit has 2 Christian churches and Byzantine mosaics. 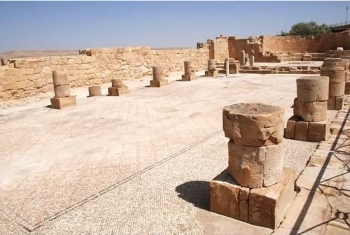 Avdat too reached its peak as a Byzantine town in the 4th/7th Centuries CE but also contains a number of ruins excavated from the Roman period. So, given that any visit to Israel should include a visit to the Negev, then at least one of these sites is worth seeing while you are down there – but don’t expect anything spectacular would be my summary. I would also find it difficult to recommend a “preference” sequence if you could only see 1 or 2 of them. I've only been to two of the Nabatean cities in the Negev: Shivta (Sobota) and Avdat (Oboda). Both are well worth a visit if you are into desert landscapes and antiques. Sobota is the better preserved one among these two. It clearly shows the original urban structure and features two churches. A nearby fruit garden uses traditional agriculture (solely based on rain water) in order to reconstruct the Nabatean way of life in this arid climate. Sobota is inaccessible if you don't arrive by car and is usually empty. During my visit here me and my friends were the only visitors although we stayed for two hours! Add the already isolated desert environment and you get a feel of what it is like to live here. Oboda is a larger complex and also has the advantage of being situated atop a hill on the road between Beer-Sheva (Bersheba) and Eilat (easily accessible with public transport). It also includes a reconstructed Nabatean house worth a visit. The surroundings are abundant with caves which the Nabateans used to exploit for various purposes. The nearby Oboda Spring is of exceptional natural beauty. If you come down here don't miss the nearby Ramon cirque by any chance. It is world unique. There are many other interesting things to visit in the Negev Heights (Ramat Hanegev) region, such as oases (Ein Avdat, Ein Zik), the Large, Small and Ramon Craters, and the recently developed wine route, which is combining eco-tourism with boutique wineries, olive growing, and the cottage-industry production of goat cheese (all of which is pretty amazing in an arid desert region of approximately 300 sunny days per year, and only about 70mm of rain). This is a less-travelled part of Israel, but well worth the visit, either as a special trip or on your way south from the centre of the country to Eilat. The roads are excellent and there is a bus service approximately once an hour from Beer Sheva. Make sure you bring a hat, good walking shoes (not sandals) and plenty of drinking water. Camp sites are not as well equipped as in some other parts of the world, but there are excellent field schools (some with hostel accommodation) and bed & breakfasts in the area. We have visited three of the four Nabatean seetlements in the Negev mentioned, as well as others further south. The Negev is a sparsely populated arid region with limited public transport, so however you travel, you will need stout footwear and lots of water. We went by car, but there are bus services from Beersheva to Avdat (Beersheva to Mizpe Ramon bus, then a long uphill hike), Mamshit (Beersheva to Dimona, then a 10 km walk or hitch from Dimona), and Shivta (Beersheva to Nizzana bus - twice daily, then a 8 km walk from the turn-off). These three towns are in a good state of repair, being only around two thousand years old, and are not frequented by visitors much. The Nabateans built the towns as a series of resting places for their caravans travelling from Egypt and Gaza to Petra and beyond. Some additions were made by the superceding Romans and Byzantines. Desert Cultural Landscapes: Criterion (v): The almost fossilized remains of towns, forts, caravanserais and sophisticated agricultural systems strung out along the Incense Route in the Negev desert, display an outstanding response to a hostile desert environment and one that flourished for five centuries. Buried treasures: Mamshit: The biggest treasure ever found in Israel: 10500 silver coins, 158 pounds of plumbum tonque with foundry signs and a papyrus cluster with Greek ancient texts. Religious Relics: Some human remains were found in one of Mamshit's churches. It is assumed they were connected to a Christian ritual. Built or owned by British: Mamshit was used as a British police station during the British Mandate. Extended from original TWHS: Originally only Shivta (Sobota).